Amoeba Records will release a major addition to Gram Parsons’ discography with ‘Gram Parsons Archives Vol. 1: The Flying Burrito Brothers “Live” at the Avalon 1969’, due October 30th from the newly formed label. The two CD, 27-track set includes a number of never-before-heard — though long rumored — rarities. Gram Parsons, leading the Flying Burrito Brothers, opened for the Grateful Dead April 4, 5 and 6, 1969 at the Avalon Ballroom in San Francisco. The April 4th show has never been heard in any form. The bonus disc is the April 6th show. For years these tapes were rumored to exist and were finally unearthed in the Grateful Dead vault. 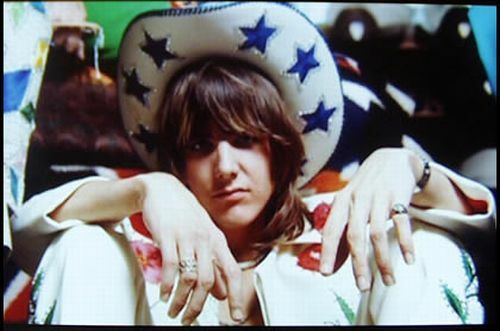 The shows were recorded by the legendary sound engineer Bear (Owsley Stanley), and are the highest quality Gram Parsons live material available. Amoeba Records, started by the owners of the revered independent record store of the same name, is launching with the August 28 release of smoky-voiced singer and songwriter Brandi Shearer’s ‘Close to Dark.’ The album is co-produced by Larry Klein, known for his work with Joni Mitchell and Madeleine Peyroux, among others. + Explore eMusic’s 25 Free MP3 trial offer. No strings. I am in love with this photo. This is the best news I’ve heard all day. To my knowledge, the only available live Gram recordings are the Fallen Angels radio sessions. His two Burrito Bros albums are legendary, and I can’t wait to hear the material in a live format. And then I say something equally excited about this news! No mention of today being the 30th anniversary of Elvis’ death but I can’t believe it was a coincidence you posted about this and used “Long Black Limousine” as the mp3. You play ’em close to the vest dontcha? I’m really interested to hear what that album would sound like. While I love Gram Parsons, from everything I’ve read about him I wonder if he was ever in a good enough condition in 1969 to put out a solid live performance. I’ll remain cautiously optimistic. Since the Burritos opened for the Dead during these shows, I had read once that Gram came out and played a few songs w/ the Dead. Has anyone else heard this? This looks very exciting..I have a couple of bootlegs from 1969 and gram holds its together pretty well.. I am listening to Long Black Limousine right now. Kind of slow, but I like!